San Francisco Berniecrats | Not Me. Us... We are the revolution. It was never one man. It will still take each of us. 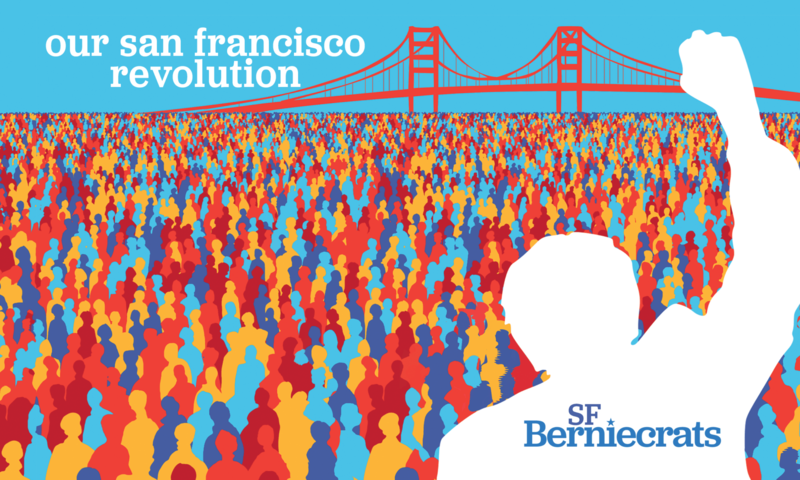 Join the San Francisco Berniecrats. Bernie Sanders’ 2016 presidential campaign galvanized a lot of people across the country. Many in San Francisco poured in hundreds of hours volunteering and organizing for his presidential run, whether directly with his campaign or at the grassroots level. These included everyone from young folks who began political organizing for the first time, to hippies who had lost faith in our political system, to seasoned political activists who’ve been organizing for decades. The San Francisco Berniecrats were formed with the aim of channeling the energy and dedication that surfaced from the Democratic Presidential Primaries into local politics in an organized, democratic manner. We held our first two meetings in July and August 2016 to vote on our name and bylaws. We elected to use the name “Berniecrats” because it signifies supporters who identify themselves with Bernie’s ideals and came together because of his 2016 campaign, but who are not bound to his every decision. It’s about We the People, not Bernie himself. With the current outcome of the presidential elections, it is more important now than ever to push for real progressive values. We believe the extreme forces of the Right can only be defeated by a populist movement from the Left, not corporate centrists without vision. To us, resisting the current administration is important, but we have to do more. We have to offer real solutions to this broken system. We welcome anyone who share Bernie’s vision in his campaign platform, regardless of party affiliation or the lack of it. We are a volunteer-run organization and a local affiliate of the national Our Revolution organization.